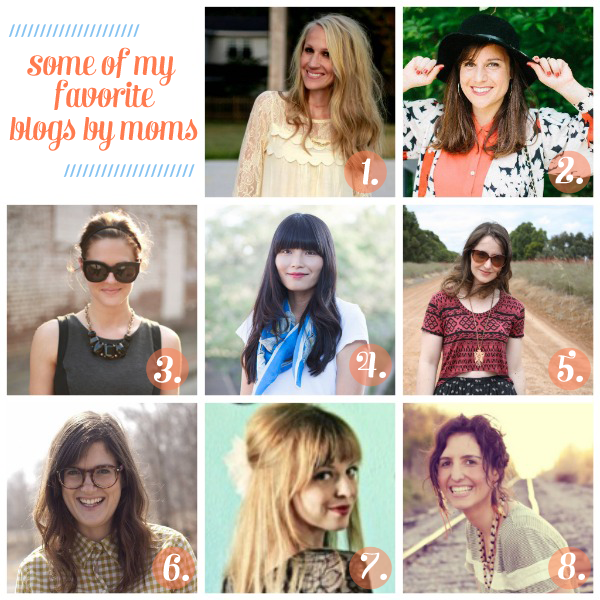 In honor of the upcoming Mother's Day, here's some of my favorite bloggers and friends who just so happen to be moms. I've been reading most of these bloggers for years and have had the pleasure of meeting all but three of them. Add all eight of these women to your readers immediately and be sure to find their Twitter and Instagram feeds, too. You won't regret it! Those who make me laugh out loud:1. Camp Patton // Grace has an amazing ability to be equal parts frank and hilarious and aspirational while documenting her kiddos' antics. She just had Baby #4 and writes exactly how one would talk to her closest girlfriends, which I just love. She's the kind of blogger you feel like you could be friends with "in real life".2. Greetings From Texas // Megan's memoir "99 Problems But A Baby Ain't One" has been one of my favorite reads this year. It made me clutch my stomach while laughing too hard which is surprising when you consider the fact that she wrote about her cancer diagnosis and treatments and the process of adopting her baby Macy. Megan's blog is a cheeky fun, easy read. Currently gestating and looking good while doing so:3. What I Wore // I've been reading Jessica's blog forever, and I'm so excited that's she's expecting her first child! Her content remains mainly fashion focused but she seamlessly ties in posts full of wide eyed wonder and recaps about her first pregnancy. 4. Little Tin Solider // Linda is one of my closest blog friends and she's also expecting her first child. I love her weekly pregnancy recaps, her simple recipes, and of course her doodles. We jokingly refer to ourselves as the Asian Elizabeth and Jessica Wakefield (I'm Jessica, obviously). 5. Megan Nielsen // Megan is my go-to read for all things sewing. She's expecting her second child and has been showcasing awesome ways to create and sew pieces specific to a pregnant lady body. Moms who have heartfelt writing and adorable offspring:6. Jen Loves Kev // I just love Jen and her family, and I truly consider her a friend. She recently announced that she and Kev are going through the process of fostering. This is something that Chris and I would like to do as well, so I'm excited about this new journey for them. They're awesome people, and her daughters are very close in age to Jude and Caroline.7. Dear Baby Blog // Melissa was the first "mom" blog I started reading after I followed her to Dear Baby from her original lifestyle / fashion Tumblr blog. She has such a warm way with words, and I love how sweet their little family is. 8. Snappy Casual // Kelsey and I met at TxSC three years ago and we really hit it off (as did our husbands). She's a working mom with one darling daughter, who I feel like I'm watching grow up since I met Kelsey pre-kiddos. I like Kelsey's straight forward way of writing and dressing. Other blogs by moms I really enjoy: Jacyln Day, The Bloggess, and Austin Eavesdropper. Be sure to check those out, too! And if you have any other mom blog recommendations or want to promote your own, feel free to leave links in the comment section!